1. Both my BFF and my work colleague’s brand new grandson make it through their planned surgeries with flying colors. 2. 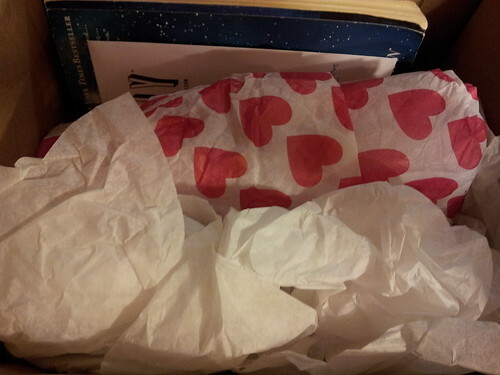 A box arrives from my college roommate smelling of sandalwood and filled with summery fabrics. 3. A missed opportunity to attend a pie festival turns into an afternoon spent sitting outside on a cafe’s warm wooden bench in the sun, drinking homemade passion fruit soda out of a mason jar while knitting and listening to music on my iPod. Earlier in the winter, Emily suggested that a swap might be in order to help cheer her up. A bunch of us agreed that we’d like to be cheered up, too, and a few days later The Swap of Discontent was born. Emily suggested that we try to give our recipient a cozy night in with makings for tasty drinks or treats, media to enjoy, and a one-skein project. Hand-me-downs were perfectly fair for sharing. 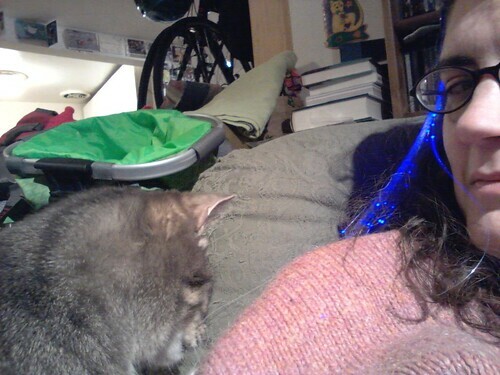 … and there was an LED barrette that Colleen assured me could be used as a cat toy. I just don’t think she meant simultaneously. 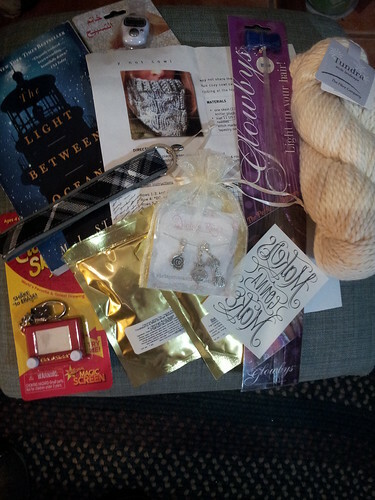 Thank you, Colleen, for such a great package. And thanks to Emily for suggesting a swap was in order. 1. Texts, tweets, calls, comments, and cards remind me that I’m not alone on my birthday and in the days that surround it. Susan and Phillip invite me to visit on my birthday eve. My brother and his partner send a beautiful flower arrangement — and then Josh follows it up by ordering a special birthday dinner to be delivered to the hospital for us. Rudi’s roommate’s fiancée runs out to the store for a cupcake for us to split. Amani and Karen send packages with things they know I enjoy. And my parents’ box contains presents handmade by my mother for the final, wonderful reveals. 2. Rudi’s doctors feel that his lungs have made good progress in healing and send him home again. The cats and I are glad to have him back. 3. Josh and Matt’s Christmas presents to us were tickets to American Idiot at the National Theatre tonight. It was fun to see a musical and to sing along with some of the songs. Today I’m yarning along with Ginny. Look! For the first time in ages (or, at least, since Rudi’s injury), I’m reading a book (or two) and working on a knitting project in the same week! 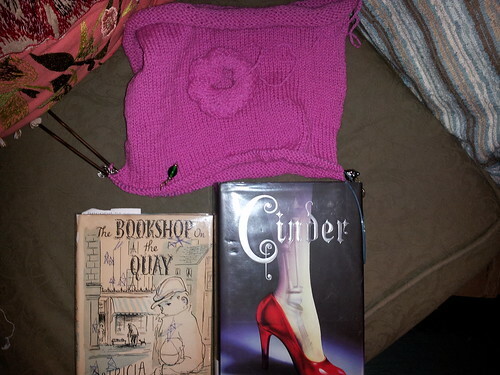 The books are Marissa Meyer’s Cinder, a futuristic retelling of Cinderella featuring a protagonist who’s a cyborg, and Patricia Lynch’s The Bookshop on the Quay, which I bought on my birthday last year from a used bookstore simply because it contained the word “quay” in the title. Category: books,knitting. 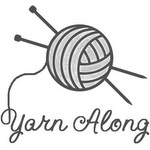 There is/are Comments Off on yarning along: mid-february. Rudi’s back in the hospital with pulmonary embolisms, so things have been a little stressed around here. No reading, although I’m listening to The Thin Man, and no knitting, which means there’s absolutely no chance of finishing the sweater I designated for my Olympic knitting. But, you know, that’s how these things go. He’s getting better and will be home again soon, and those are the important things. 1. My parents send a box full of prettily wrapped and bowed birthday gifts to be opened throughout the week. I open at least one at the end of each day, and some I use as an incentive to get through rough patches. As I open the packages, I eat heart-shaped cookies my mother sent back with me when I was home last month and try to guess what each item could be. (Sparkle sugar was an easy one; funkily patterned tights not so much.) To be honest, this week would have been much more challenging without this box o’ love. 2. An online friend, reading of how hard I’ve been taking this last month, makes a donation on my behalf to Heifer International, one of the charities I support. So now every time I see a flock of ducks, I will think of Jessica and her thoughtfulness. 3. My car fails inspection — twice. After the first time, I take it to a mechanic recommended by a friend of Rudi’s, who also drives an elderly vehicle, and get it tuned up. After the second failure, I call the mechanic back and ask what our next step is, and he suggests it’s likely a catalytic converter problem. Turns out he was right, and he and two other mechanics were waiting to show me what mine looked like when I picked up the car. (Imagine one of those peekaboo Easter eggs, except it’s made of metal and filled with a scene of post-apocalyptic platinum rubble.) He finds me a new, less expensive converter, installs it for just the cost of the part, and sends me on my way. It is with great relief that I pass inspection on the third try. 1. Rudi is home after nearly a month of mending post-ski accident. 2. After the work deadline that I need to meet hits an insurmountable roadblock after 11 p.m. on Friday, I resign myself to the situation. But, unbeknownst to me, our programmer and a colleague keep working after I log off email and plow through the problem all weekend long, so when I log back in on Sunday afternoon, it’s been resolved. 3. I have a desperate, visceral need to throw something, but breaking things requires cleaning them up and carries a threat of endangering cats. While on an errand, bowling pops into my head and I realize that’s the compromise solution I need. The lane they assign me has the bumpers up still and I leave them, because they help to compensate for my uneven game and allow pins to fall nearly every time, which was, after all, the point. After 20 frames, I am feeling more sane.